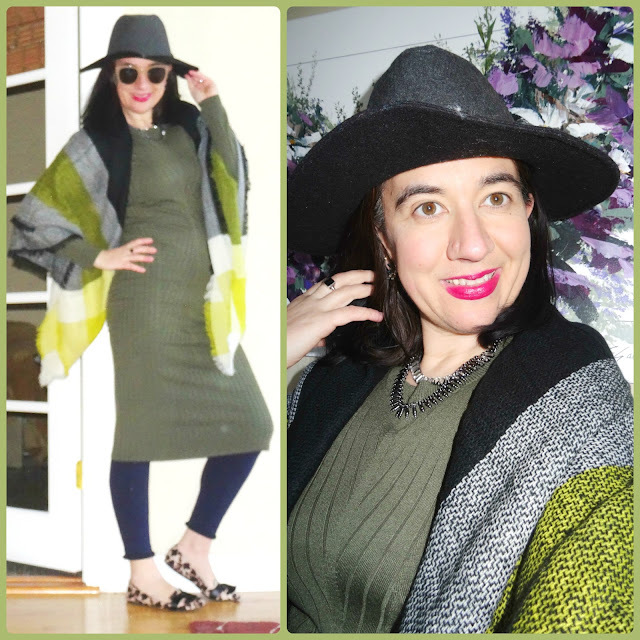 Thursday Moda #60: Layers of Olive, Navy and Grey. Good Morning everyone! 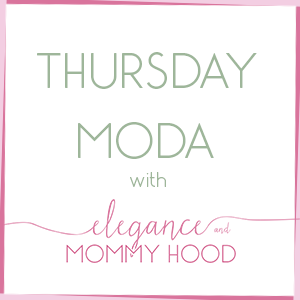 Welcome to another Moda Thursday or Fashion Thursday. This outfit is about a month 'old' and I apologize about that but as I said a couple of weeks ago I lost one of the memory cards for my camera. Well, weeks later I found it in one of the nooks/mini shelves of Vivian's princess castle, among her other tiny miniature toys there lol. 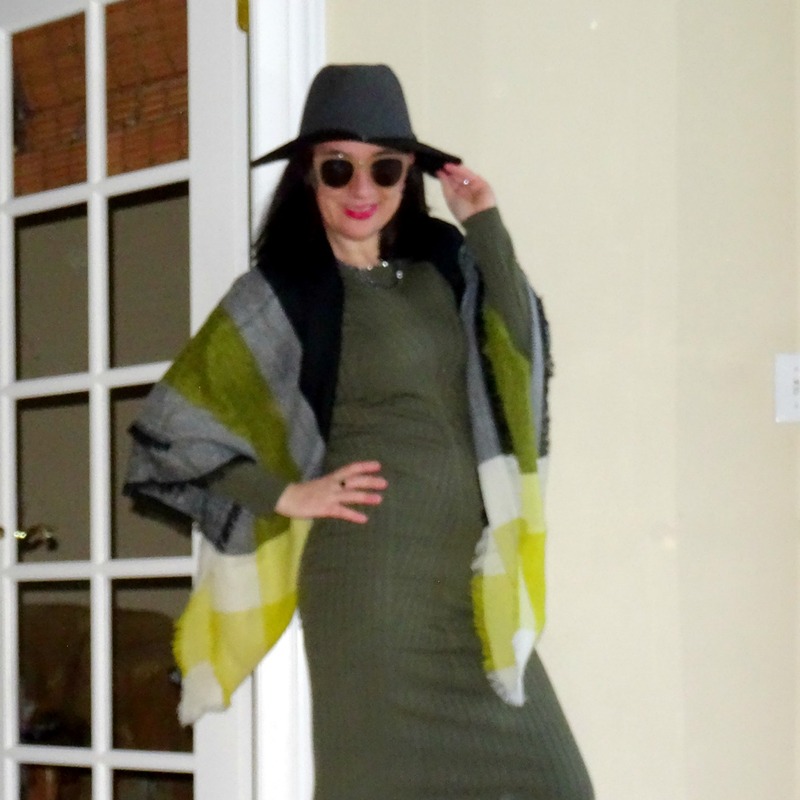 I wanted to post this outfit not because it is the best one but I do like how well the shades of olive green, navy and grey looked together and I do believe that a blanket scarf is a great transitional piece for Spring which can substitute your jacket or heavy coat. I love that this sweater dress is a light knit, has long sleeves and a midi length. All of these elements make it perfect for Spring. I plan to wear this dress soon but it is warmer now so no leggings, just bare legs. 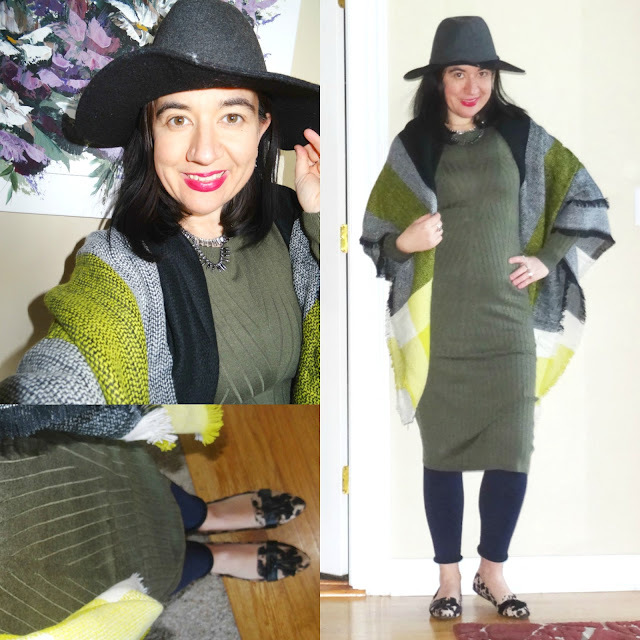 I love how that cozy blanket scarf picks up all the colors of every individual piece, yet that bright yellow pops against my sea of neutrals. For an even more feminine pop, I added a bright red lipstick. I wish you could see my stud earrings better too, because the colors of the stones (3 rows) are in grey, blue and green. And sorry, I cannot stop wearing these leopard loafers lately, starting since March through now, I have worn them about a dozen times. In this case though leopard and olive is a match made in heaven. Olive Green Long-Sleeve Ribbed Midi Knit Dress: Mossimo via Target (similar, Steal), (quite similar, Steal, love this), (similar w/ black panels, Great Deal, my Favorite). Yellow/Black/White/Gray Buffalo Plaid Colorblocked, Wool-blend Blanket Scarf: Nordstrom (similar, Huge Steal, love this), (similar, Steal), (similar in blush+grey, on Huge Sale, my Favorite). Navy Shimmery Rolled-Hem Cropped Leggings, lined w/ Fleece: Hue via DSW (similar, Huge Steal, love these), (similar, Steal), (similar, on Sale, my Favorite). Red Semi-Matte Lipstick: "Jungle Red" by Nars (identical + my favorite red lipstick ever! ), (similar, Great Deal, love this), (similar, Steal). Blue Ombre "Elyza" Ear Climbers: Perry Street via Rocksbox (New) (gorgeous turquoise option, Steal), (similar turquoise pave option, Great Deal, love these), (quite similar in aqua & ivory, Small Splurge, my Favorite). Silver Crystal + Black Metal Double Strand "Lane" Statement Necklace: Slate via Rocksbox (New) (similar, Steal, love this), (similar w/ stars, Great Deal, my Favorite), (similar, on Sale), (bold multi-stranded option, Splurge). 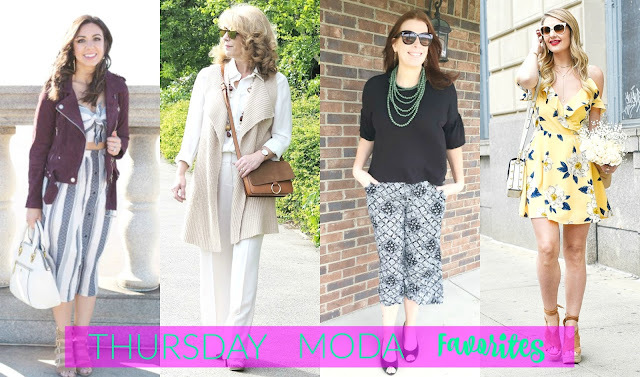 Last week on Thursday Moda, an impressive number of outfits (about 120) were linked up. There were so many beautiful pants' outfits that were linked, a couple of which I even included in my favorites of the week. And as always florals rule my heart come Spring. Check out these beauties, below! This week's featured blogger is ALISON from Get Your Pretty On, a veteran blogger who linked a post featuring the prettiest green floral dress and the prettiest navy floral jumpsuit both of which, as she mentioned were great options for both Easter and Mother's Day. These pieces have similar colors in the floral pattern: ivory, light blue, blush and pink and feature pockets as well as the same neckline: a split neck. Plus her dress had bunnies - how perfect was that for Easter! 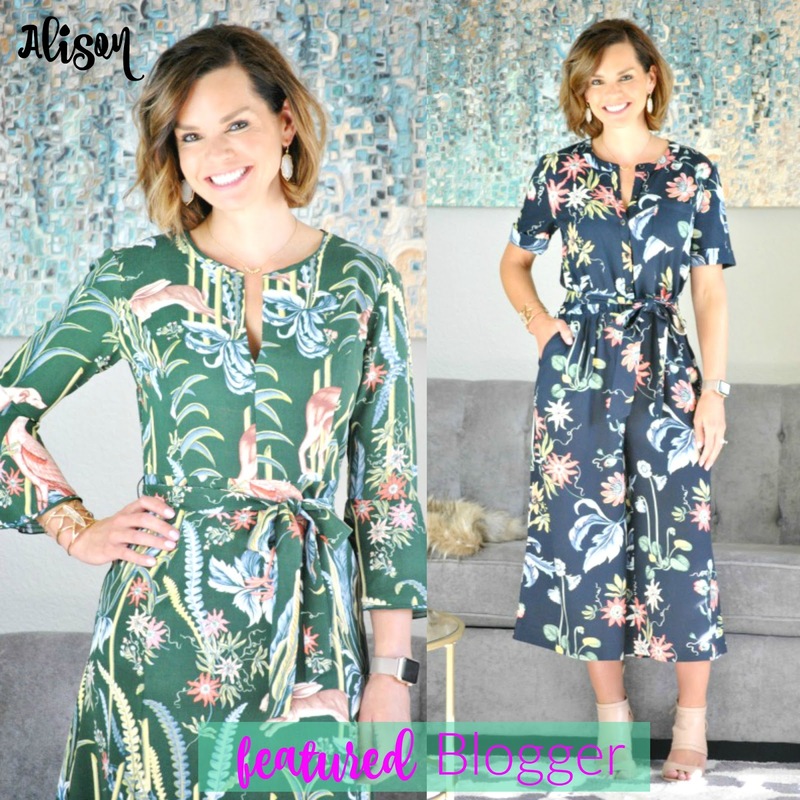 Alison's blog is one of the first ones I read when I started blogging 5 years ago. She continues to be a great inspiration to me when it comes to her personal style, home design, shopping guides and especially her style challenges and capsule wardrobes she has been doing for a few years now, every season. She picks pieces that most of us own in our wardrobes and guides you into how to wear them, what to pair together, etc. Alison is your personal stylist. And by the way, she has her own linkup on Wednesdays, too. 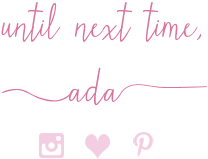 Make sure you stop by her blog if you haven't already. Roxanne's gorgeous outfit was entirely gifted by 'Lord & Taylor', the first department store I ever shopped at and my favorite still. Her dress, jacket and shoes are gorgeous, especially altogether. Laurie often dons neutrals like white, tan, beige and gray in the most elegant way. In collaboration with 'Daniel Wellington Watches' she showcased a classic watch and pretty Spring layers - love that vest. I have been loving culottes lately, especially cropped and Jaymie describes her patterned pair as 'Fun Pants' which paired with the peplum sleeve top, look so nice. Jenna shows off a 'Yellow Floral Dress' in the prettiest exotic print with ruffles around the neck and cold shoulder sleeves. Her fresh flower bouquet added to the Summer feel.